Idea exchange utilizing our National Student Project Database—fully accessible by affiliated schools only—so you can get your next best idea for a service project or recognition ceremony. Most entries are from middle level and high schools, but many can be adapted for elementary students. Digital and print publications, a monthly e-newsletter and quarterly print newsletter, featuring news, chapter profiles, and chapter management guidance. It’s very simple. Your school first needs to start a chapter. 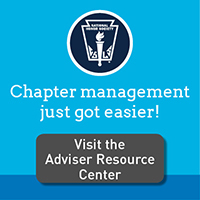 Visit our Start a Chapter page to learn more and get an application. You can also email membership@nehs.org or call (800) 253-7746, option 4.